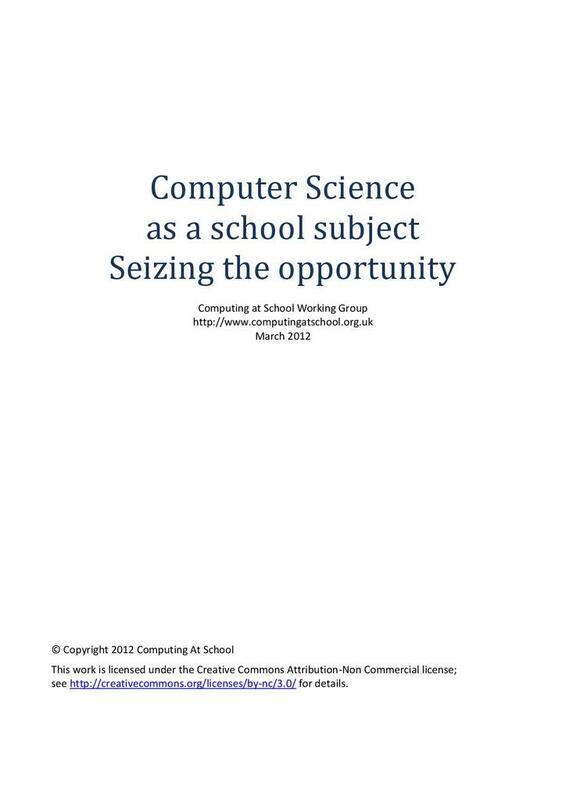 This briefing note, intended for Governors and Senior Management Teams, fleshes out the background to the introduction of computing in schools and is intended as a basis for a strategic debate about reform of the ICT curriculum. It has been written mainly with schools in mind, but the broad outline of the argument applies equally to Sixth Form and Further Education Colleges. • To be the fourth science. • Is a discipline, like mathematics physics, or history. It has a body of knowledge, established techniques, and thinking skills, that will last students a lifetime. • Is educationally important. Just as we give every student the opportunity to learn the workings of physics, chemistry, and biology, because they live in a physical, chemical, biological world, so we should offer every student the opportunity to learn the workings of the digital systems that pervade their world. • Embodies logic, rigour and problem solving. • Is economically important, because digital systems have become a critical component of our entire society. Offering Computer Science directly addresses the problem that ICT has gradually become a low-status, low-achievement subject. This resource has been provided by Computing at School.